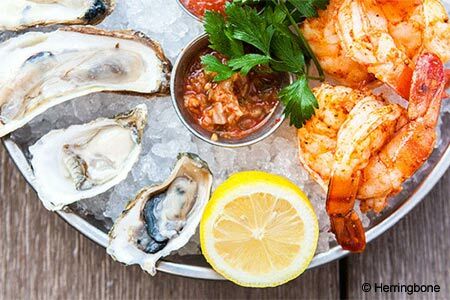 Stylish La Jolla restaurant for seafood and a lively scene. Entertainment: DJ Fri.-Sat., acoustic music Sun. : Herringbone is a shining example of cutting-edge style and progressive food in a harmonious union. L.A.-based designer Thomas Schoos strikes again with playful yet elegant décor in this warehouse space that features 100-year-old indoor olive trees sprouting from the ground, a pufferfish chandelier, colorful-tiled bar and a whale skeleton hanging above it. Diners get front row seats to watch the action in the glass-enclosed exhibition kitchen. The menu specializes in surf ‘n’ turf with twists --- an ocean bazaar theme in a high-energy setting. A nice start for oyster fans is a tilt of the head to allow a medley of Kumamotos, Malpeques and Fanny Bays to slide down the throat. Consider, too, albacore tuna tartare with guajillo salsa, or whole fish ceviche. Grilled wild prawns come with kimchi-fried rice, while the mussels arrive tiki masala-style with grilled flatbread. Slow-cooked Angus short ribs satisfy carnivores. Olive wood-fired flatbreads run the gamut from a simple margherita to a seafood mix of calamari, bay scallops and shrimp with artichokes. Dessert delivers a nice finish with a chocolate-hazelnut crunch bar. The smartly curated wine list features gems like Hudson Vineyards Carneros Chardonnay, ideal with fish, and Bueyes Torrontes from Argentina with crisp floral notes, a prime companion to the raw bar delicacies.